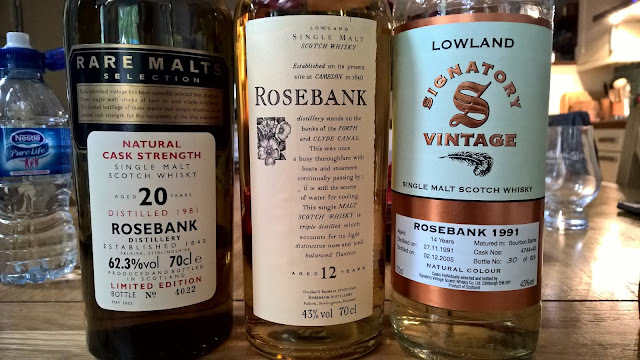 Finally we're completing this Rosebank vertical with the arrival of the 1981 Rare Malts release pictured above. Without question this was on paper the star dram and rounded off the mini-vertical in Falkirk. You can read the previous Signatory and Flora & Fauna reviews and my other Rosebank posts right here. It has been an enjoyable trip finished off with visiting the distillery as it stands today, which was a mixed emotional experience knowing what it is capable of and the sad, isolated and decaying appearance it now offers. I have posted several photographs of Rosebank distillery since visiting the site in the summer and you can catch these and more whisky photos on my Instagram feed here. The Rare Malt series is now very popular at auction regardless of which distillery was bottled. So the chance to taste this Rosebank bottled at 62.3% is a welcome and rare opportunity. Nose: zingy lemons and peaches greet your arrival. Then moving past the cinnamon and fennel, you reach some parma violets and honey with plenty of butterscotch. Crushed grapes, vanilla, honey and soft banana. I could nose this for hours. Taste: more lemons and its surprisingly drinkable at this higher strength. Less detailed than the nose yes, but nevertheless hugely enjoyable. Black pepper, vanilla pod, bark, lemon sponge cake. A pure floral finish with lemons that lingers. A very good example of a Rosebank but still some distance from the George Strachan 12 year old bottling, which was sublime.